A development at N Greeley & Killingsworth by Works Partnership is currently under review for building permit. The project for Jacobsen Development Group consists of two 3-story buildings on an 11,1163 sq ft lot in the Overlook neighborhood. 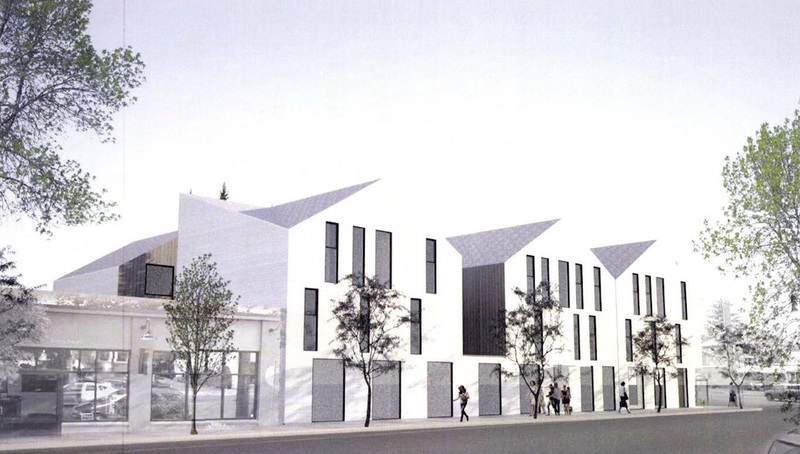 The building facing N Killingsworth will include 11 residential units and 1,680 sq of retail space at the ground floor. The building behind it will contain 15 residential units. No on site car parking is proposed. 29 long term and 2 short term bicycle parking spaces will be provided for the residential units, along with 2 long term and 2 short terms spaces for the retail spaces. The site at 2730 North Killingsworth Street currently has a single story restaurant building on it, for which a demolition permit has been issued. The parking lot was formerly used as the North Station food cart pod, visible below in 2011. The closure of the cart pod was reported in April 2014. 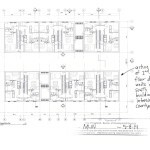 The applicant has requested one Adjustment to the maximum height standard of the CN1 zone in association with a planned mixed use development at this site. The proposal meets the relevant approval criteria for several reasons. First the proposal is designed with approximately 17% less building coverage than is allowed by right in the CN1 zone. Second, the floor area on the second and third floors is less than that on the first floor which reduces the massing of the building. 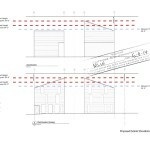 Third, the increased 4 feet 3 inches of building height (if measuring the height of the rear portion of the building) requires an additional 3 foot set back from the property line shared with the residentially-zoned lots. This is almost one foot in additional setback for every additional foot in height. Finally, the social spaces of the dwelling units on the second and third floors face the internal courtyard. 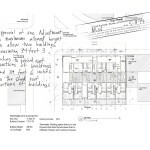 This reduces impacts on privacy for the residential lots to the south of the project. 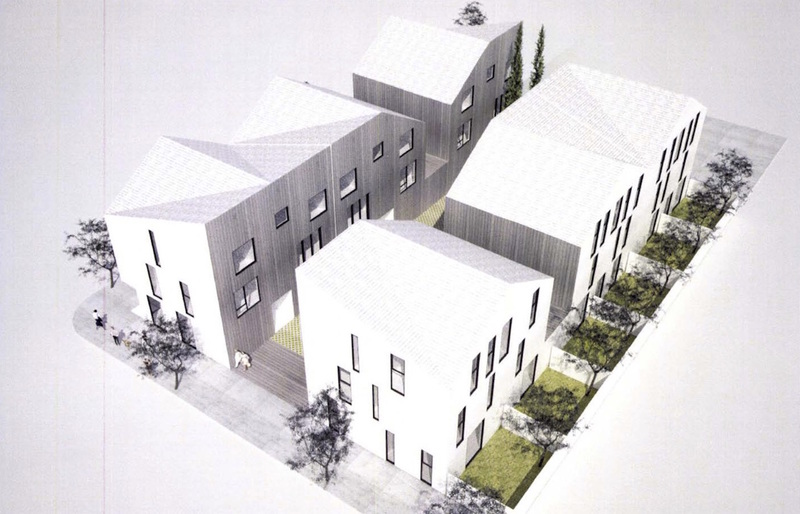 The proposal is also consistent with the classification of adjacent streets and, on balance, supportive of relevant zoning characteristics, the plan district purpose statement and policies of the Albina Community Plan. 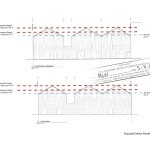 The project appropriately mitigates for impacts through the dwelling unit layout on the second and third floors and pitching the roofs appropriately toward surrounding residential development. With conditions of approval, this proposal meets the approval criteria and should be approved. This entry was posted in Greeley & Killingsworth, Jacobsen Development Group, Overlook, Works Progress Architecture. Bookmark the permalink. Looks like Works Partnership copied and pasted the Langano Apartments on Hawthorne to this location. Great to see more development in this part of the city though. Any word on where the food carts will relocate to? I believe that the food carts have all already relocated. I’m not sure where to though. Sad to see such ugly, cheap, and faddish architecture going up where it isn’t needed. Still, wealthy single people need expensive boxes in which to live. Soon all of PastPortland will be obliterated by NextPortland. Micky hits the nail on the head. The site needs more commercial properties if anything. As with so many other developments in Portland, the absence of parking is ridiculous given the limited transit options in the vicinity. This is pure money-grubbing, aka gentrification. There are bus lines on both Greeley and Killingsworth and the Yellow line MAX is not far away. I don’t think its “ridiculous” to imagine someone wanting the option to not pay for unnecessary parking in their rent. There is plenty of street parking in the area anyway, as it is mostly single family homes and many have driveways. It is also a very bikeable area. The assumption that everyone wants to have their own car and park it at their apartment is outdated and will severely misguide how we shape our city in the future. Also, it makes absolutely no sense to say that building more apartments is “gentrification.” Rapidly rising property values and rents are what causes displacement and gentrification. Building more apartments increases the supply, which brings down the overall housing prices and increases affordability. This is elementary level economics. If you want to look at what happens when you refuse to building more housing to meet demand, try renting an apartment in San Francisco. This sounds like the complaining of NIMBY neighbors that are only concerned with plentiful free street parking in front of their homes and not wanting “renters” living nearby. I’d prefer this “fadish” architecture any day to the faux historic cartoon cement boards being put up elsewhere in town by other firms. At least this design involves thought. Imagine, conservatively, each condo owner has one car to park. Each car needs approximately 10 feet of curb space. Time limit parking (15 to 60 minute?) exists on the block in front of the condos. No parking exists on the Greeley side. The co-housing and apartments the next block down has about the same ratio of parking spaces (0:1) and so those surrounding blocks are usually full. This leaves condo owners to start their parking hunt at least a block away. During any given weekday, approximately half the street space is taken with home owner and business patron cars. Overlook has rectangular blocks – Approximately 264 feet on the short ends and 528 square feet on the long ends. In this scenario, the first half of the condo owners might find parking a block away and the second half are certainly looking at two or more blocks away. Don’t forget the influx of car prowls in the neighborhood. They’ll be delighted with new pickins’. This is fine for downtown Portland. This is not acceptable for a suburban neighborhood. Would you buy a condo with no parking in the burbs? Do you think you could resell this shiny new condo once you decided you couldn’t handle constantly trying to find your car? I’m curious where you live and if you drive a car. Where do you park your car? Are you married and does your wife have a car? Where does she park her car? I am a resident of the Overlook neighborhood and while I am not opposed to this mixed use development it is sad to see the food carts go. I am also concerned about the lack of parking for 26 residential units. Our home does have a driveway but only accommodates 1 vehicle so my husband has to park on the street everyday. We are also competing for parking with the employees who come into our neighborhood to work at the various restaurants that exist here. Perhaps some of the residents of your development will not have cars and will use mass transit. If this is the case more power to them. However, I am guessing that this is highly unlikely. Rather than labeling the concept of on site parking outdated, let’s just call it what it really is, putting a desire to yield maximum profit over the needs of your residents and the community. Tracy, you might want to check your hetero-normative assumptions when asking someone about their “wife”. The 1950’s are thankfully long gone. You have every reason to be concerned about the storage of privately owned automobiles in the public right of way. The answer, though, is in controlling supply and demand for the existing parking, not increasing capacity (particularly for small- to mid-scale projects like this). There are a lot of options under consideration for how to do this. I recommend author/professor Donald Shoup if you’re interested in delving deeper into the issue. Sooner or later, the City will be forced to deal with the issue and hopefully the concept of “free” parking will be history. If apartment dwellers had to pay for a permit to park their cars in the public right of way (combined with meters on commercial streets) that would add some pressure to the incentive of living in an increasingly dense/transit-accessible/bike-able neighborhood and not bothering with a car. I’m very sorry to hear that hubby might have to park one of your two climate change machines a few feet further away from your house. It completely acceptable for someone to have to walk two blocks to ride the bus or the Max or to use car share. So what’s the big deal if you have to park your car two blocks away and get a little exercise walking to your house? We live in the city and there are constraints on space. It makes me think we have no hope at solving any of the large issues facing the world today if we can’t even get past the selfishness of limitless free street parking in front of everyone’s residence. If street parking is so valuable to you, then you should advocate that it have a price and be willing to pay for it. the parking element is shear crap….that’s all about $….no masking that…. PatrickR, you might want to read up on the architect and their building history before commenting on the materials. Unlike many of the buildings going up in PDX right now (see: hardie board siding) Works has an impressive portfolio and they clearly care about using high quality materials. In terms of the design, you might not find it appealing –I’d love to hear some examples of projects that you DO like– but many others do. This is 2015. We should be constructing contemporary buildings that honestly reflect the times, not faux-historic fakery that “fits in”. In terms of scale I think this design is thoughtful and appropriate. Also, can you explain a bit more about what you know in terms of the finances behind including or not including parking in projects like this? Sounds like you’re probably an expert (“shear crap”) so please educate us. This is a very residential neighborhood. This structure pretty much duplicates the Alberta and Mississippi “contemporary” building aesthetic…..AND still looks like manufacturing typology….there’s nothing “faux-historic” about building to conforming standards of a neighborhood – its either good design or poor design…in this case just it looks like it was done between glasses of wine on a cocktail napkin somewhere at a trendy restaurant in NW PDX…ALL DESIGN IS REFERENTIAL and would be considered “faux-whatever” so don’t give me that bs….in this case it’s just “factory” or “manufacturing”…….there’s a very nice structure of condos on Burrage just across the street, with parking, that fits in quite nicely into the neighborhood in fact…. So, you can take your Fake structure and fit it nicely into your contemporary/”thoughtful” personal design niche…. No roof over hang fad started by Newell Jacobson back east . Maintenance nightmare in 5 years ! Totally agree. This has the look of contrived gentrification. Renderings with out Downspouts and gutters also. Architect wake up this is RAINLANDIA.